Key Features• Hardened Punch Die System: Individually cast-hardened and heat-treated steel punch dies ensures many years of trouble-free operation. • Modern & Compact Design: Sleek and stylish design that fits in any professional office or copier room. 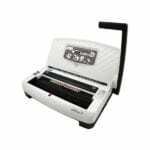 • Easy & Efficient Operation: Simple 2-step setup & 15-sheet single punch capacity makes your binding job easier than ever! • Wire Measuring Guides: Built-in guides help determine the correct wire size to be used for any given book thickness. • Available in 2 versions: iWire 3:1 version binds up to 9/16″. iWIre 2:1 version binds up to 1-1/4″. • Vertical Punching: For easy alignment of sheets and reduced punching errors. • Anti-Dust Cover: Keep the inside of the machine clean & dust-free when not in use. • Ergonomic Handle: For a smooth and effortless punch everytime. • Wire Size Guide • Waste Drawer • Wire Holder: Holds wire in place for easy insertion of sheets. • Wire Size Selector: Determines the best wire size to be used on your document. • Wire Closer Selector: Slide the selector bar & set the wire closer according to your wire size, for a secure closure every time. • Side Margin Control: Guarantees a well-centered punch on each document.